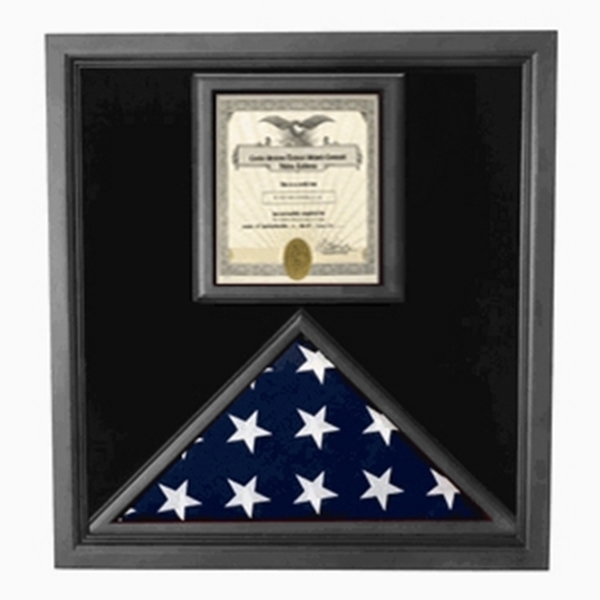 Flag Display Cases Hand Made By Veterans, MADE IN AMERICA !! Choose from Solid Oak flag cases, Cherry flag display case, Mahogany flag display cases or Walnut flag cases. 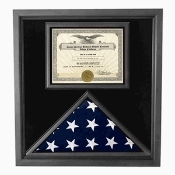 We offer Flag Cases designed specifically for the Burial, or Coffin Flag. 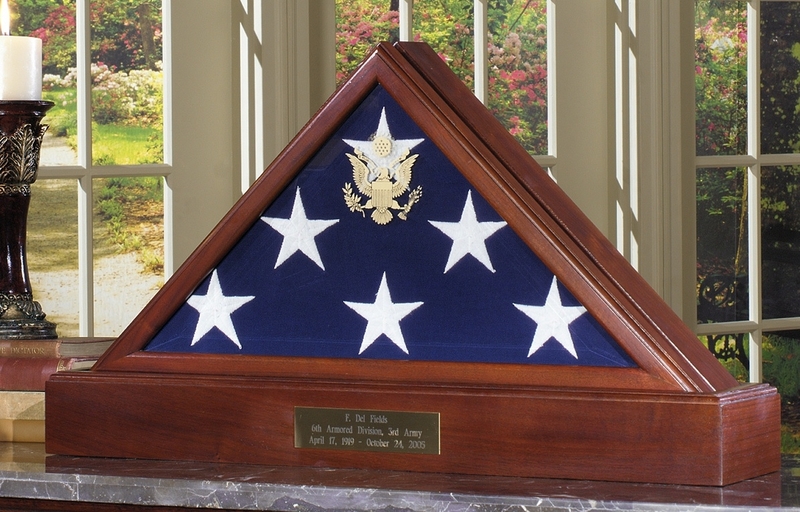 Our Large Flag Display cases was designed specifically to display the Burial flag, or Casket Flag which, when unfolded measures 5 ft. x 9-1/2 ft.
Our flag cases are perfect for displaying your military memories & keepsakes. We have a large inventory of styles, sizes & finishes! Choose from Solid Oak flag displays, Cherry flag frames, Mahogany flag frames or Walnut flag cases. Looking for the right gift to honor a veteran of war? American Flag Display case !!!! If you have said "yes" to any of these scenarios, then you have come to the right web site to shop for all of your needs. At Flag Connections we have a large display of flag cases to proudly display the American flag. This is a unique gift, especially since you can have the case uniquely engraved honoring your special loved one. 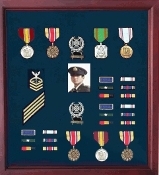 We also have several Military Medals Display cases you can choose from as well. Give the gift of thanks as we salute our military personnel and honor all what they have done for our beautiful country. 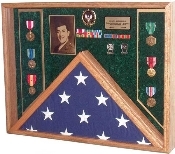 Flag cases, shadow boxes and certificate holders provide a protective display for a folded burial flag, Our Flag and medals/awards are made in USA. 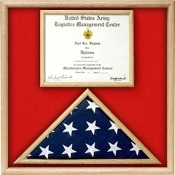 Our Military Flag and Display Cases are great products for your memorial flag and memorabilia. 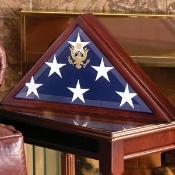 Flags Connections is a patriotic company dedicated to honoring those who have faithfully served their country in the armed forces, be it Army, Navy, Air Force, Marines, heroes of both retired military and the fallen, with a prominent line of handsome, custom made U.S. flags, memorial flag cases, shadow boxes and flag boxes. 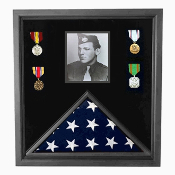 Flags Connections specializes in flag cases and military gifts, for both those serving in the armed forces and their families at home who wish to honor their memory through posterity. So trusted and revered is the Flags Connections name brand that they were selected to provide the flag case for President Reagan's burial flag in 2004. 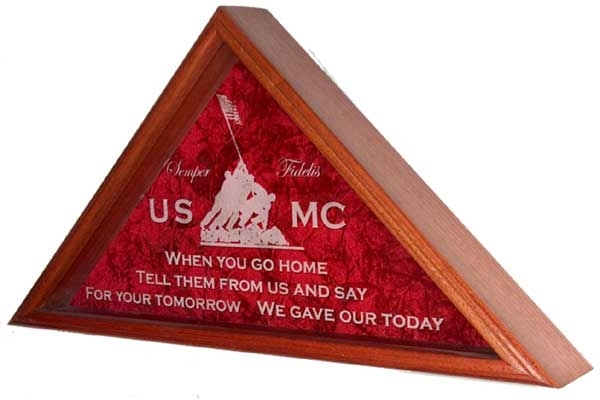 Made of finely crafted red oak with an elegant cherry finish, the Military Flag and Medal Display Frame – Shadow Box from Flags Connections makes an illustrious gift for military servicemen, servicewomen and their families. 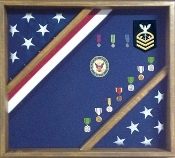 Interchangeably, it serves beautifully as a Navy display frame, an Army display case, a Coast Guard display box or an Air Force display case. 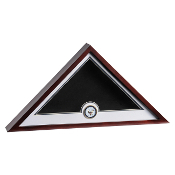 At once, it is ideal for displaying medals, insignia, certificates and flags together in one handsome case. 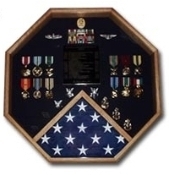 Flags Connections' Military Shadow Box is manufactured in the U.S.A. and its military flag display case holds room enough to hold a 3 ft x 5 ft folded U.S. or military flag. 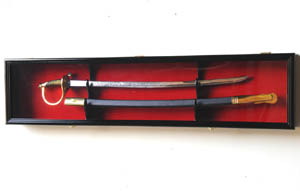 The size of the case measures 19 inches wide x 20 inches tall. 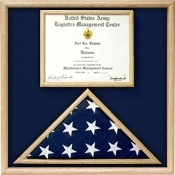 Its certificate holder's dimensions span 8.5 inches (from the top of the display case to the top of the shadow box) x 15.5 inches (running from side of the case to the side of the box). The medal display area of the box is lined with rich, black felt, allowing for the brightest display of your loved ones' awards and insignia – making the perfect contrast against silver, nickel, gold or brass – and showing them off in a most glorious fashion. 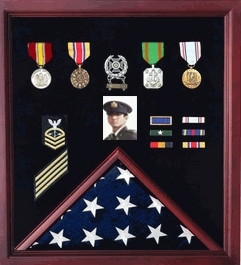 The Military Flag and Medal Display Frame Shadow Box by Flags Connections complements the presentation of these tributes, in a professional display to honor the glories won by that special military man or woman in your life, capturing their stories for ages to come. 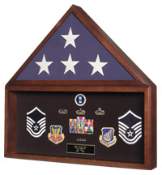 Much More Than Military Display Medal And Certificate Cases Military Flag Display Cases make great gifts for families of those who serve in the military, veterans, and those who have been or are about to be deployed for the first, second, third or fourth time. 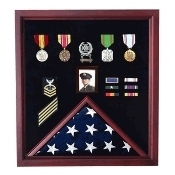 Flags Connections has Burial Flag Cases, Flag Shadow Boxes, and Flag and Medal Display Cases that commemorate people who have served in the United States Army, Air Force, Navy, the Marines, and the National Guard, You can even buy Flag Cases for police officers and fire fighters. 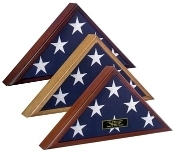 The larger 5’ x 9 ½” Flag Cases are the perfect size for a burial flag. The high quality wood allows the piece to be elegantly displayed at a memorial or funeral service. 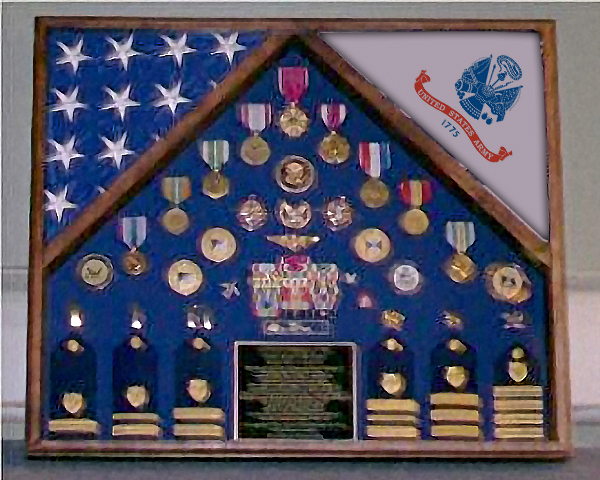 The smaller Flag Shadow Box will easily accommodate a banner that is normally displayed outside of the home. 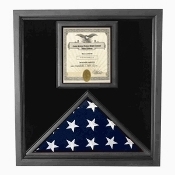 Order oak or cherry Flag and Certificate Cases for family or friends who have served in the military. These gorgeous cases are expertly designed to show off medals and certificates in any home or office. The smaller Flag Display Cases are made out of the same superior materials for a Flag Shadow Box that can be passed down from generation to generation. 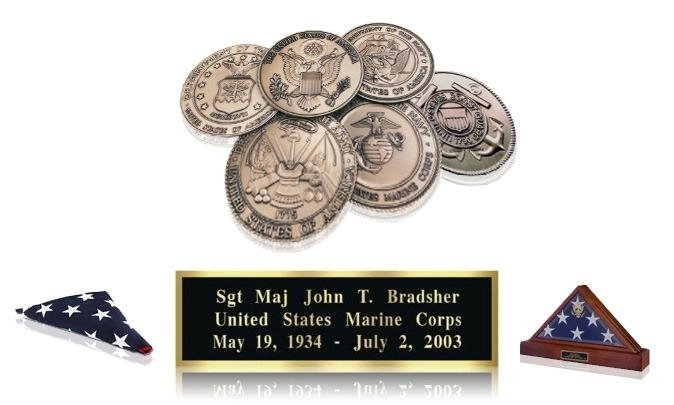 These keepsakes will preserve the memory of every American Hero. 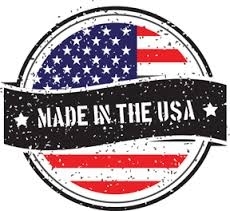 If you are looking for oak or cherry wood US Flag Cases and Military Display Cases, check out the easy to use Flags Connections website. 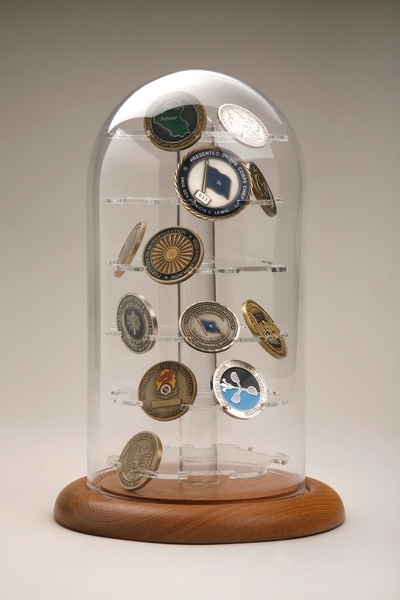 You will find display cabinets categories, tabletop, optical showcases, and freestanding Military Flag Shadow Boxes.